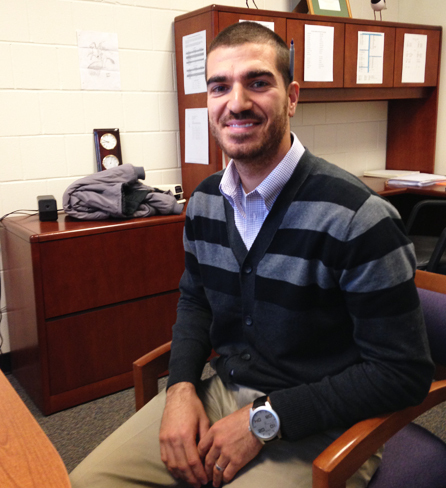 One of the busiest members of the STEM Academy is technology specialist Josh Rodrigues. Josh is in his third year in the Sandwich schools and taught technology to high school students for the last two years. When asked about why he moved to STEM he described the excitement and interest that his students showed with various projects such as studying code. His students didn’t want his class to end and he feels that he can bring that same motivation to all middle school students. “Kids get wrapped up in it,” he observed. Josh received his Bachelor’s degree in history from Bridgewater State University where he is currently pursuing a Master’s degree in informational technology. He also holds a certification in technology and his expertise is in big demand by teachers and students at the STEM Academy. Josh is also an assistant head coach for freshmen football and helps with the varsity team on Fridays. In the spring he coaches baseball and served as an umpire for six years at several middle and high schools in the region. This has been a busy year for Josh. Not only did he join the STEM Academy, but he recently married and moved into a new home. From chrome books to internet challenges to the installation of projectors, Josh has been a vital and significant foundation of support for our faculty and students. He can be found in any class in STEM as he makes the rounds and moves our school into the widespread use of one to one technology. I think it’s safe to say that one of the reasons the STEM Academy is off to a great start is the work and assistance of Josh Rodrigues.